More specialized design. 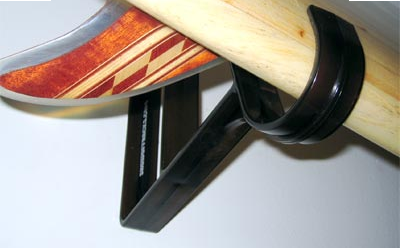 Here, when mounted, the rack sits out from the wall so your surfboard can sit in the rack with its fins in. Ideal for the frequent surfer, great for dawn patrol. Comes in 2 colors - black or clear. Grab the clear one - combined with the low visibility of the rack's arms, your board will look like it's floating. Keeps the focus where it should be, your surfboard.